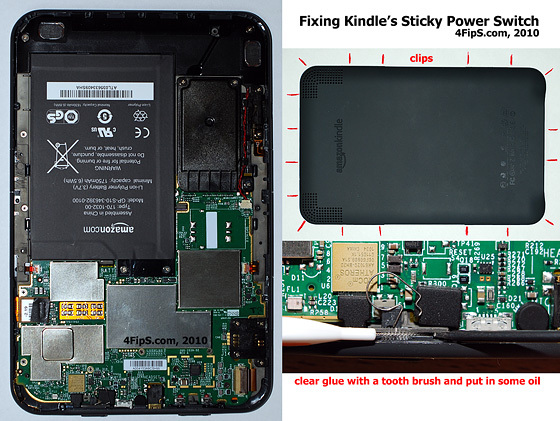 After a few weeks of using my Kindle the power switch have started to get stiff and sticky (too slow to move back to its rest position after dragged). I’ve found on the Internet that I’m not the only one affected by this issue and got the basic idea what might be wrong. As I usually get very annoyed by this kind of things I’ve decided to deal with the problem immediately. First, there’s a good video to watch on Youtube to get the basic idea what you might expect inside your Kindle. I encountered this video some time ago and now it’s been more than helpful. So to get inside you need to release a bunch of plastic clips (the picture below shows their layout). Then use a tooth brush to clear sticky glue that causes all the troubles. I've also put a tiny amout of oil in to be sure the spring mechanism will operate smoothly. The switch now works as expected, no more troubles!